The West Highland Way is one of Britain’s best backpacking routes, and the first designated long-distance trail in Scotland. Every year, thousands of people walk the 94 miles / 151km from Milngavie near Glasgow to Fort William in the heart of the West Highlands. The trail will take you through spectacular landscapes, and presents a challenge for any walker – yet it’s also one of the more accessible long-distance routes in the country. 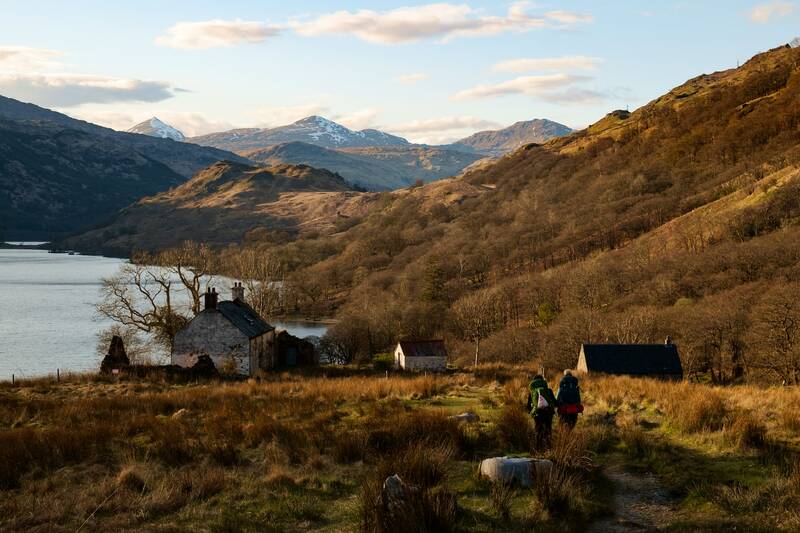 Here’s why you should hike the West Highland Way, and how to do it. This feature was first published in Outdoor Enthusiast Top Trails, May 2017. Milngavie might seem like an odd beginning, but the iconic starting point, through a metal arch right next to the local Gregg’s in the town centre, is a huge factor in the trail’s success. It isn’t obscure or difficult to get to. It’s right there in the middle of town, a short bus journey from Scotland’s biggest city. Anyone can hike the West Highland Way. I started my walk on a frosty morning in April. The first people I met were early dog-walkers – ‘Doing the Way, aye?’ – and I soon found myself blazing ahead, subconsciously walking a little faster because I wanted to clear the built-up areas and get into the hills. The first day eased me in with a variety of easy trails, gentle countryside, and promising views to the Campsies and greater mountains beside Loch Lomond. That first wider view north into the Highlands, a rugged landscape glittering with promise, cast a little light on why the WHW is so attractive. From those first few miles in a suburban landscape, the trail reveals its treasures gradually, building up a sense of anticipation as each landmark is passed. 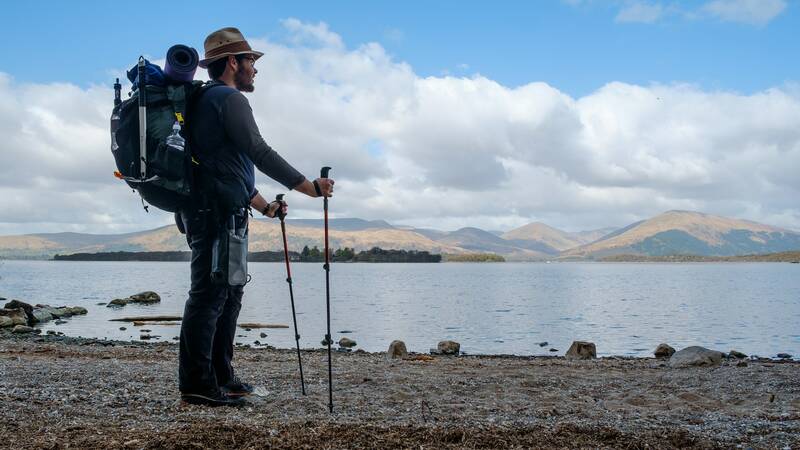 Walk the West Highland Way and you’ll see the whole length of Loch Lomond, catch a glimpse into the Arrochar Alps, cross Rannoch Moor, and walk beneath Ben Nevis towards the finishing line in Fort William. There are silent forests, tall peaks, deep waters. The West Highland Way has a bit of everything. People of all ages and abilities walk this route, in part because it offers a great balance between wild country and hiker-friendly facilities. You won’t have to carry food supplies for more than a few days, there are accommodation options, and for most of the year you’ll never be far from other walkers. So when should you walk it? Most people take on the WHW in summer, but I’d argue this isn’t the best time of year. Midges can make hiking in Scotland miserable during the warmer months, and you may find the trail busier than you’d like, with full campsites and bunkhouses. April, May or October are quieter, the colours on the mountains are more interesting, and you won’t be bothered by battalions of midges. There is, however, always the risk of snow on the higher areas outside high season. With the right equipment and preparation this only adds to the adventure, but less experienced walkers should be wary of taking on the trail in poor weather. WHW hikers should have a base level of fitness. You should be confident in your ability to walk for 10, 15 or 20 miles a day (depending on how slow or fast you want to take it) while carrying a pack over rough ground. What about navigation? This is a waymarked route, but don’t fall into the trap of thinking you can get by without a map. Sections of the WHW climb to high elevations in a mountain environment, and in poor visibility or snow you will need the ability to use map and compass to keep going. The Cicerone guidebook to the WHW is a valuable aid but not essential if you have a map. Other equipment is a matter of personal preference, but every walker should carry waterproof and warm clothing, a comfortable rucksack, camping equipment (tent, sleeping bag and sleeping mat), water bottle, stove and food, emergency equipment (whistle, torch, mobile phone) and appropriate footwear. Hiking boots are still the most popular choice, but I chose to hike in lightweight trail shoes for greater comfort. Make sure you have prior experience of walking long distances in trail shoes if you choose this option for the West Highland Way. The paths are very rough and rugged in places. 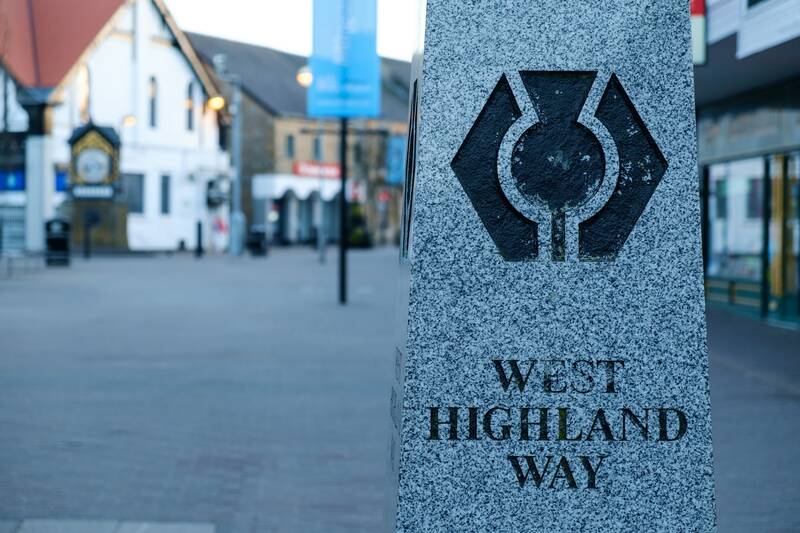 Most walkers should allow between five and eight days to complete the West Highland Way. If in doubt, allow more time than you think you might need. The terrain gets tougher as you travel north, so allow more time for the second half – but walking northbound is arguably the best way to enjoy this unique mountain landscape. I made friends early on the second day of my hike. I’d just dipped my toes in the freezing waters of Loch Lomond and was picking up my rucksack to continue on my way when I heard a call from behind me. A young couple scrambled over the rocks in my direction. They introduced themselves as Renato and Maiu. They worked in Glasgow and had always wanted the chance to see a bit of the Scottish landscape they’d heard so much about. Now they were on their third day of the West Highland Way and could hardly stop talking about the amazing things they’d seen so far. I usually make a point of guarding my solitude on the trail, but Renato and Maiu were excellent company. Experienced travellers but inexperienced long-distance hikers, they were full of questions about backpacking in Scotland. They told me of their ambition to spend a year backpacking around Europe, hiking the Camino de Santiago and other long-distance routes. The WHW was to be their first real big walk. The trails on the east bank of Loch Lomond passed through forests just starting to sprout with a fuzz of new spring growth. We kept up a good pace despite frequent breaks to snap photos through the trees. Further north, the track suddenly became a lot rougher – rocks, tree roots, even boulders conspired to slow our pace, and we spent a few hours overtaking a group of mountain bikers laboriously carrying their bikes over the rough sections, then being overtaken once again where the trail improved. We finished the day at Doune bothy – an unlocked, basic shelter free for the use of all. Despite its position on the busy West Highland Way, we found the bothy clean and tidy and stocked with firewood. That night we passed the time telling stories around the fire and speculating on what we might find further north. If you plan to wild camp on the WHW, there are some access restrictions it’s important to be aware of. 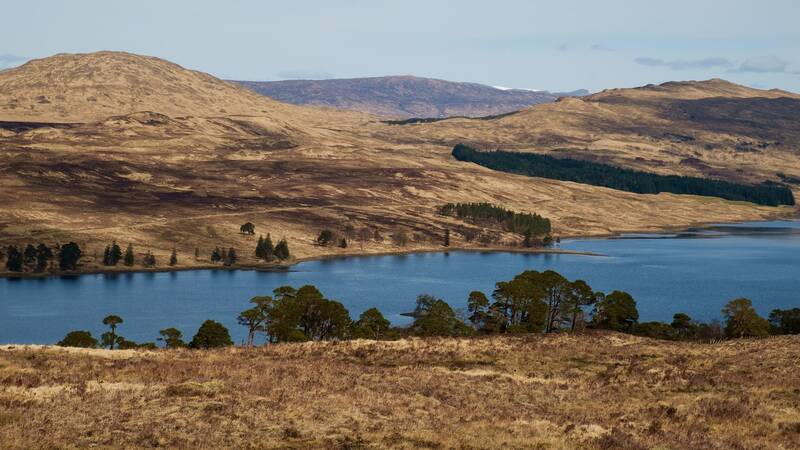 When I hiked the route, in spring 2016, wild camping was banned between March and October along much of the eastern shore of Loch Lomond, from Drymen to beyond Ptarmigan Lodge. I camped on Conic Hill just before the restricted area, which was well signposted. It’s important to note that the situation subsequently changed in the Loch Lomond & Trossachs National Park, and may change again in future. 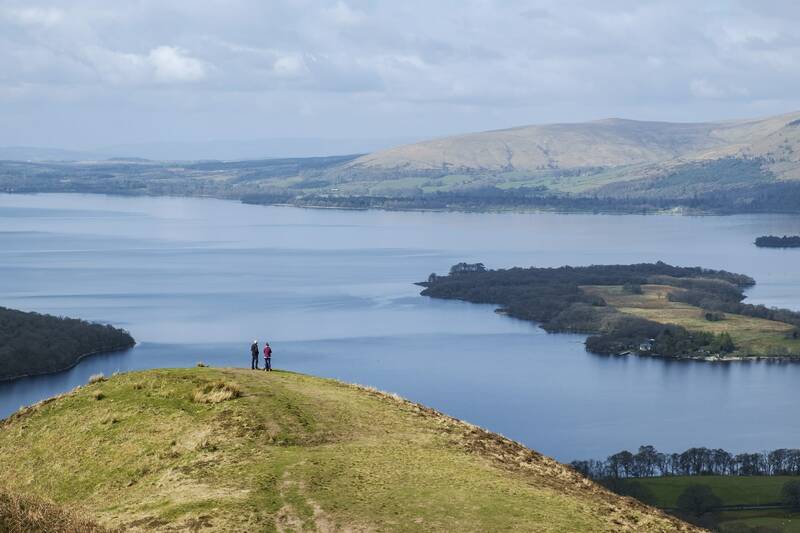 From 2017, the camping ban was extended to cover West Loch Lomond, Trossachs West and Trossachs North. Check the current situation at http://www.lochlomond-trossachs.org before you start your hike. Outside this area, walkers in the Highlands enjoy the right to wild camp on unenclosed, uncultivated land. Leave no trace, drop no litter, and respect the landscape. If you would rather stay at established campsites, there are several options. I passed campsites at Drymen, Balmaha, Inverarnan, Tyndrum, the Kingshouse Hotel (where the pub runs an informal campsite), Kinlochleven, and finally Glen Nevis just before Fort William. There are also numerous hostels, bunkhouses and hotels along the way (advance booking recommended, especially in summer). You can pick up food supplies at several places on the WHW. There are small stores at Drymen and Balmaha, and larger shops at Tyndrum and Kinlochleven. Pub meals are a welcome option too – you’ll pass several excellent Highland inns. After the forested shores of Loch Lomond and the close-sided Glen Falloch, the landscape opens up beyond Bridge of Orchy. And this is where the West Highland Way begins to feel a little wilder, a little more majestic; here it starts to earn its reputation as one of the UK’s best-loved trails. I’d left Renato and Maiu behind, but we’d promised to meet up again before the end. The trail took me past the eastern end of the Black Mount, a rugged and snow-dashed range of mountains sweeping west into Glen Kinglass. I spied Munros I’d climbed years before – peaks from which I’d looked down and watched walkers on the trail I now trod. Next came Rannoch Moor. This bit’s special. The path may be easy underfoot, but all around, huge open spaces drew me on – a vast silence interrupted only by the murmur of water and wind. I passed a walker lost in contemplation of the scudding light and shadow. When I said hello, he told me he never would have believed such a landscape existed in the UK. This isn’t a place for getting lost; it’s a place for finding yourself. 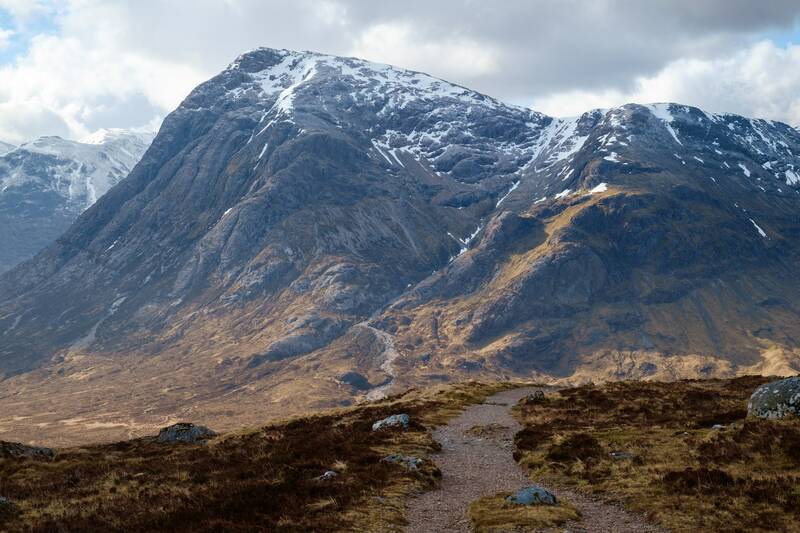 I know Glen Coe well, so already had a good idea of what to expect when the trail started to drop down towards the Kingshouse, but that dramatic view of Buachaille Etive Mor never fails to make my heart beat faster. The weather turned as I left Glen Coe for the final leg of my journey. Snow and fierce winds battered me on my climb up that Devil’s Staircase, and it felt like winter again for that final day. But I was back in the mountains again. It felt good to be home. What about Renato and Maiu? I bumped into them in Glen Nevis, just a mile from the end of the West Highland Way in Fort William. Blisters and snow had challenged them, but they’d completed their journey, and were more enthusiastic than ever about their future backpacking plans. It’s great to see newcomers face a challenge and emerge more experienced than before. We kept in touch, and in autumn 2016 they completed the Camino de Santiago – all 500 miles of it. They aren’t newcomers any more. The West Highland Way has been the making of many a backpacker.